It is great having Leon over in the UK. Leon Robbins for those who don’t know is a legend in the mountainboarding world. He is one of the big names, and personalities who pretty much everyone knows. 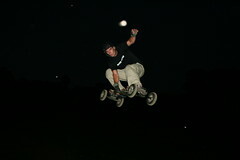 Our top mountainboard, the Pro 100, is his signature model. Leon’s style is very aggressive and powerful. Rhys is one of our up and coming riders who helps us out with a lot of promo work. A lot of people who have seen the MBS Pro Ramp or been to the British Championships will recognise his voice, as he is often on the mic commentating and pumping up the crowds. See more photos from Leon and Rhys’ session at Bugsboarding.